Lessons Are In Full Swing! As we roll into October, I'm thrilled to have a band of 85 students at Schiesher! Wow! Now that we are a couple weeks into lessons, students are beginning to get the hang of checking the lesson calendar, arriving on time, and helping to work together as a team to make sure all members of their lesson group remember the schedule. I appreciate their responsibility! They are making steady progress in their playing, and it's great to hear. This month's newsletter includes some helpful practice suggestions for home, information about after-school rehearsals starting in November, and some exciting upcoming concerts you may want to attend! Just a reminder that www.lisleband.com is a helpful resource for your student and for you! After-School Band Rehearsals Start Tuesday, November 6th! Our much anticipated after-school band rehearsals will begin at the start of next month and will continue every Tuesday that school is in session. Rehearsals are from 3:15-4:15 at Lisle Senior High School. Students will be dismissed early from Schiesher on Tuesdays and will receive bus transportation to LHS. After the rehearsals, two 5th Grade Band buses will take students to appropriate neighborhood bus stops. If your child goes somewhere other than your home address after school (after-school care at Schiesher, grandparents' house, etc. ), please email me at pmeyer2@lisle202.org and let me know as soon as possible so I can set up an appropriate route. You are also welcome to pick up your student from LHS after rehearsals. Since the bus routes are relatively large, this option will provide your student a bit of a faster trip home. These rehearsals are incredibly important to each student's musical development as playing in a full band is a significantly different experience than a small group lesson. Students are required to be at all rehearsals. Starting in November, your student will need to begin bringing his/her instrument every Tuesday in addition to his/her usual lesson day. I'll send out an email reminder the week before about after-school rehearsals, but if you have any questions, please contact me! The St. Olaf Band On Tour! In college, I had the privilege of performing as a member of the St. Olaf Band, one of the nation's premier undergraduate instrumental ensembles. 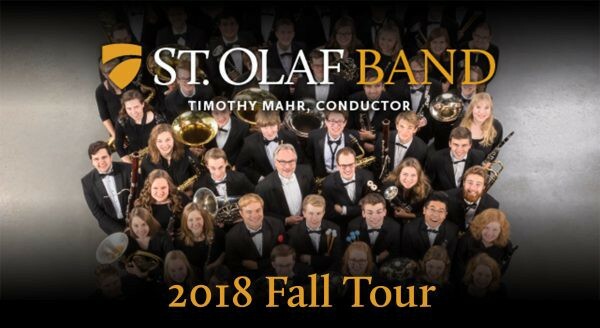 The St. Olaf Band is an amazing group of young people who, under the baton of Dr. Timothy Mahr, perform outstanding literature driven by a passionate dedication to musical excellence and to each other. The ensemble is on their annual tour in October and will pass through Illinois. Seeing and hearing more mature performers can really inspire young musicians, and I know your child would love the experience! Plus, student tickets are free! The evening will be well worth the drive. More information and tickets are available here. I cannot recommend these performances enough. The LHS Marching Band performs their final Pixar-themed halftime routine of the football season! The opportunity to display your pride in your child's musical involvement in Lisle schools by purchasing a yard sign through the Lisle Band Parent Organization has been extended! The customizable signs cost $15. See the form below for more information, and have your student ask me for a form if you need one. The new deadline for turning in forms/payment is Monday, October 8th.